Giant’s Dirt-E+ line-up has been given a new and higher-performing look for 2018 and here we review the striking looking hardtail E+2 PRO model. In terms of headline points there are many similarities with the Scott E-Aspect we recently reviewed; motor and battery are sleekly integrated into the overall appearance of the bike and the weight is a very respectable 22.4kg. The Sync Drive Pro motor is one of the lighter crank drives out there and its peak torque rating of 80Nm is almost on a par with the Brose. Let’s get the should-know complicated bit out of the way first; the Giant SyncDrive Pro motor, in hardware terms, is the Yamaha PW-X motor. However, Giant have been allowed to tweak the software that dictates how the power is delivered and also to choose their own battery. 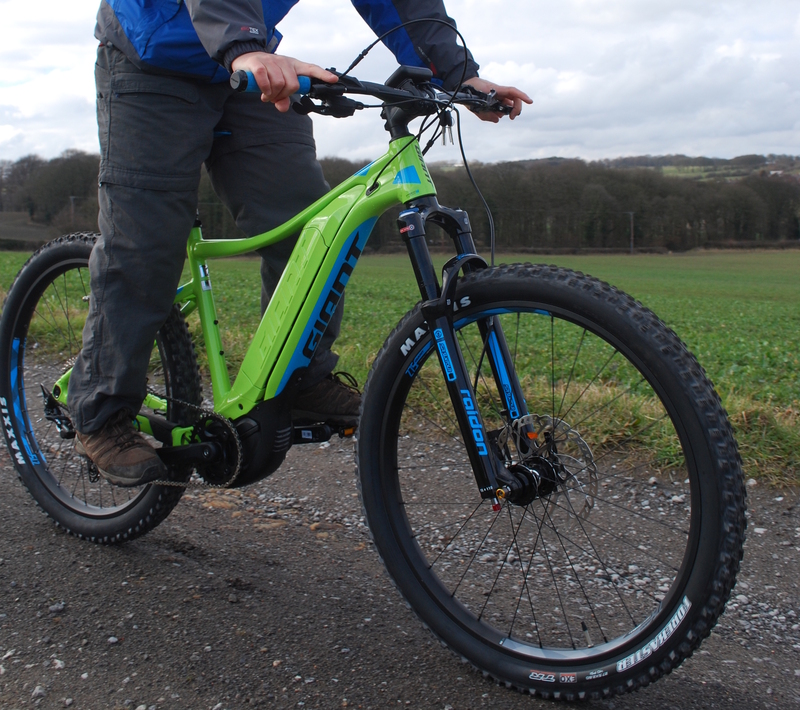 So whereas some other Yamaha-powered e-bikes have an off-the-peg motor-battery-software combo the Giant is unique. The 2018 SyncDrive Pro motor is ‘performance’ rated within the Giant e-bike range which offers three motor classes (Life and Sport being the other two – for more sedate riding styles). The Pro motor has 360% motor assist in its top setting (compared to 300% in Life and Sport classes) and is also 380g lighter. 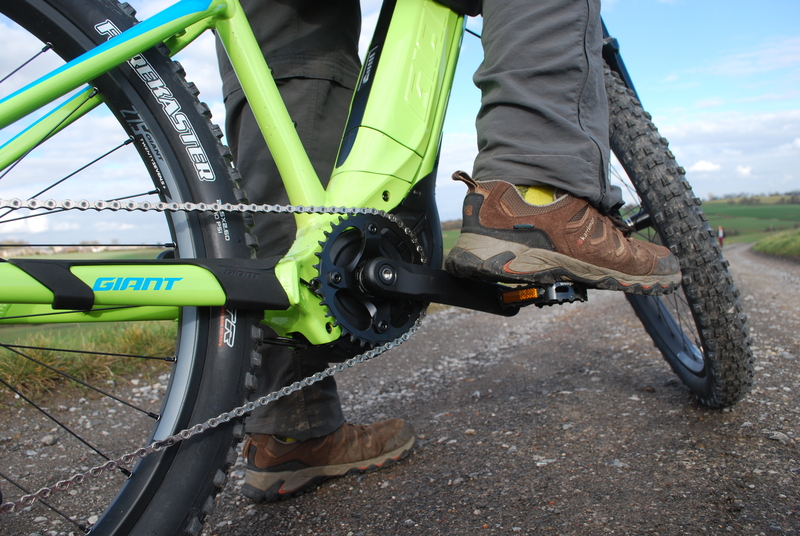 There’s more detailed comparisons between Giant’s different motor classes here, and more on the intricacies of the Pro motor system itself here. There are also other new and welcome changes; the 500Wh battery with Panasonic cells removes sideways, allowing for the characteristic ‘dipped’ topped tube meaning mounting is easier and the step over height is smaller too, allowing for shorter riders. Other aspects of the frame redesign include longer chainstays to allow for larger volume tyres and ‘slacker’ headtube geometry (for more stable and comfortable riding rather than immediately responsive riding). Not mentioned on the bike’s spec sheet but big pluses for us are the mounts for a side-stand and rack. There is even integrated cabling pre-fitted which can use the battery to power lights. This means the bike can double as a touring and commuting bike ready for all conditions at all times of day. The most noticeable thing about this motor is how it immediately kicks into life as soon as you put pressure on the pedals and the great speed it maintains up the very steepest of hills. But the power delivery feels smooth too and the transition from powered to unpowered riding is not too noticeable. The motor certainly felt punchy; we didn’t come across any hills where the top power setting was needed, so that alone is testament to its power. It would have matched or maybe even excelled the power of the Brose. Above the cut-out speed of the motor assist pedalling was pretty easy – again probably on a par with the Brose. One area where it does loose out to the Brose is that it is a little noisier (we’ve used the Brose as a point of comparison simply because it was the last bike we tested). 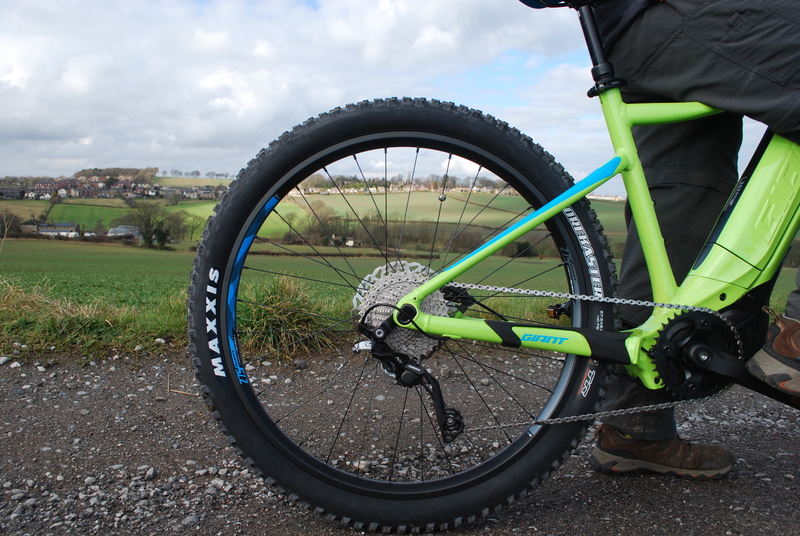 The 120mm front travel was adequate on the bumpy tracks and bridleways we tried out the bike on and it can be made easier or harder to suit the terrain, simply at the twist of a dial in the top right of the suspension – easy enough done on the fly. Our test track was mainly stony tracks and minor roads but it would have been interesting to run these tubeless tyres on very muddy tracks at low pressures to get the best out their tubeless characteristics. This is a very thoughtfully put together package; in reality the difference in performance terms between Yamaha, Bosch, Brose and Shimano motors (the main contenders at the high quality end of the e-MTB market) are real but quite small. 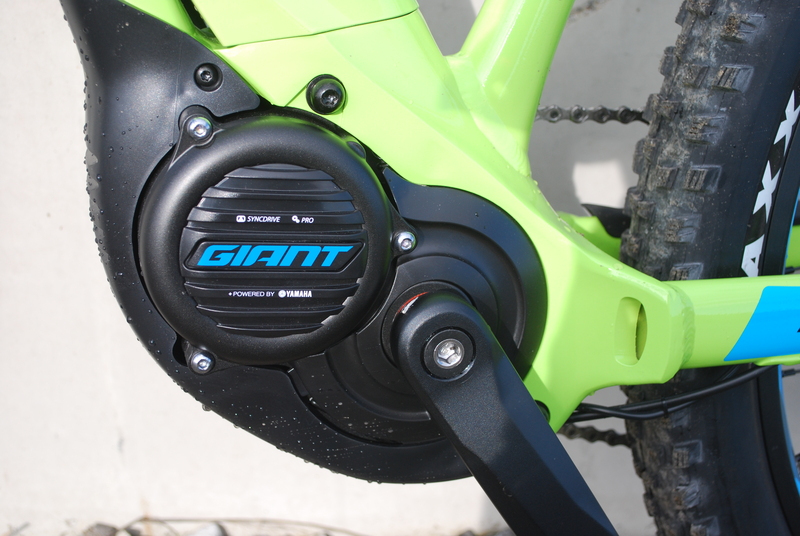 Certainly Giant’s twist on Yamaha’s top performing motor is up there with its competitors. But the Dirt E+2 Pro differentiates itself in other ways; a more compact and easy-to-mount frame and tubeless tyres are just a couple of examples. 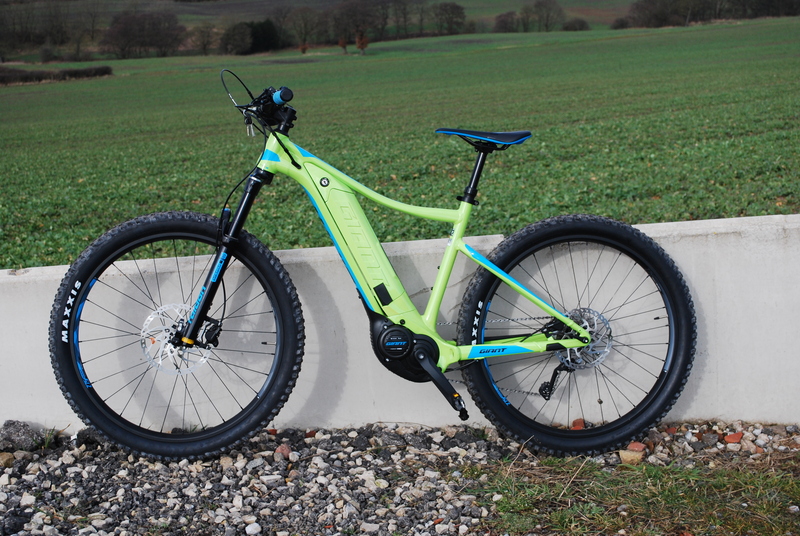 But perhaps best of all is the price (£2895) – for an e-MTB with a premium spec performance motor it looks just as competitive as its fine motor.